For my foreign readers – Dear all, I have the honor to introduce to you my new poem written in Armenian and titled “When you miss somebody” (written by me in 2001). As always I tried to translate the poem for all my foreign readers. The following is a literal (word for word)translation of the poem, trying to make the meaning of the poem more understandable and available for all. While reading the poem enjoy also Vladimir Cosma’s wonderful music from the heartbreaking film “The Fugitives”, 1986 (“Les Fugitifs” (original title, french)). Both the film and this music wonderfully express human longing and love in human close, kind relations, both the film and the music wonderfully express what you feel when you miss somebody, when you feel a huge long for somebody. Just a day, what has happened? Just wait! © Author – Arlen Shahverdyan, 30.05.2016. The poem is translated into English by the author. Հարցազրույցի անոնսը «Առավոտ» օրաթերթի կայքում: 23 մայիսի, 2016 թ. / Aravot Daily Newspaper Website, Notice of the Interview. May 23, 2016. Dear readers, I my pleased to inform you that an interview with me was published on May 24, 2016, in the authoritative daily newspaper “Aravot” (English translation: “Morning”). In the interview I have spoken about my literary activity and introduced my new book “Spring Requiem”. I deeply appreciate this publication and hope that you will read it with interest. I would like to express my deep gratitude to the editorial staff of the newspaper. 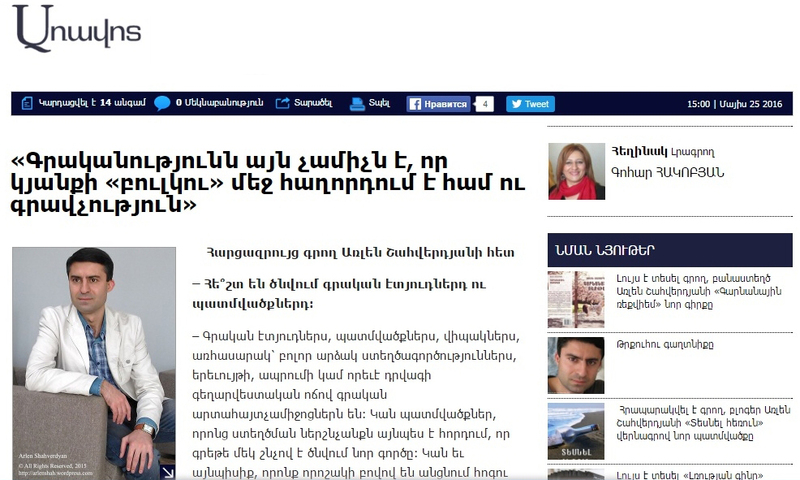 I appreciate Gohar Hakobyan for taking this carefully made interesting interview. My special thanks to Aram Abrahamyan, Anna Israelyan and Margarita Harutyunyan. I respect very much the whole staff of the daily newspaper “Aravot” for their top quality professional work. 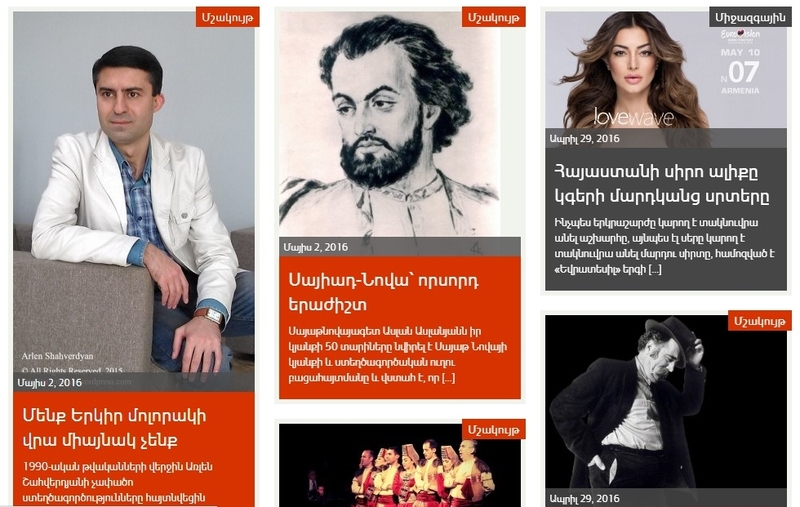 You can find the interview (in Armenian) in today’s edition of the newspaper or here – on the official webpage of “Aravot”. Dear readers, I my pleased to inform you that on May 22, 2016, the Radio Station “Online Radio” aired a large interview with me in the programme “Young Writers”. During the interview my literary activity was presented. While answering to the interesting questions, I tried to express my thoughts on writing and creative activity in general. At the end of the interview I read two of my poems. 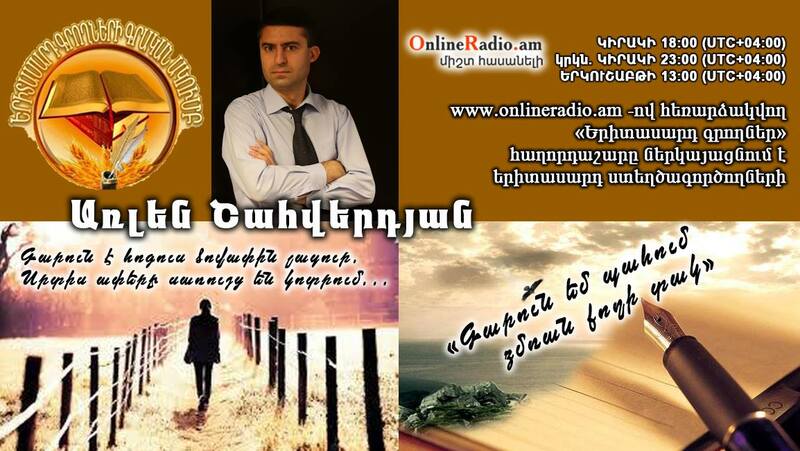 I would like to express my deep and cordial appreciation to Sargis Abrahamyan, founder and head of the “OnlineRadio.am” and Sona Vanyan (Sonet), the announcer of the interview, young writer, philologist, founder and head of the Young Writers’ Literary Club for this interesting and carefully made interview as well as for the top quality professional work. You can listen to the interview here – on News Website “Onlineradio.am”. 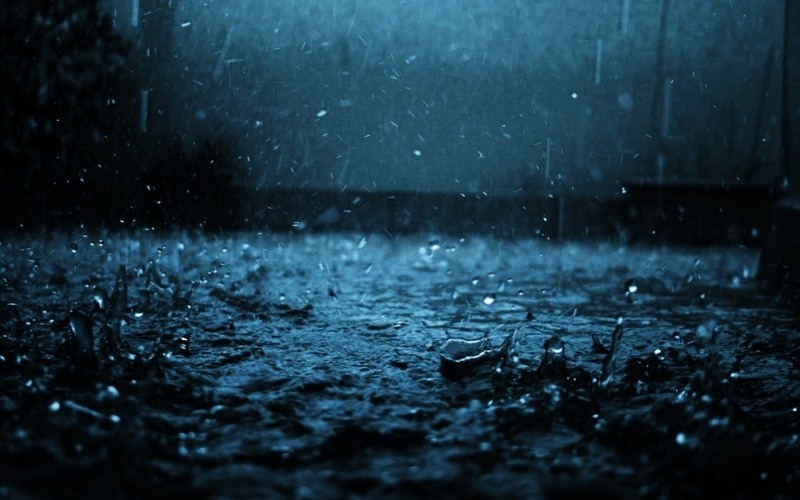 For my foreign readers – Dear all, I have the honor to introduce to you my new poem written in Armenian and titled “Such a night” (written by me on 21/22 night, July, 2002, 03:00-03:30 AM and finally elaborated on May 19, 2016). As always I tried to translate the poem for all my foreign readers. The following is a literal (word for word) translation of the poem, trying to make the meaning of the poem more understandable and available for all. And it so much looks like a found vivid dream. Where the past and the present are being washed. In order then to recall all those memories with great pleasure. The feast of the arrival of Spring. © Author – Arlen Shahverdyan, 19.05.2016. The poem is translated into English by the author. Ու ցնծում է իմ ստեղծագործ հոգին, այրվում է անմար կրակով անվերջ. For my foreign readers – Dear all, I have the honor to introduce to you my new poem written in Armenian and titled “When you are in freedom” (written by me on 12 May, 2016, 13:20 PM). As always I tried to translate the poem for all my foreign readers. The following is a literal (word for word) translation of the poem, trying to make the meaning of the poem more understandable and available for all. It wants to embrace the nature, warmly, with boundless love and deep respect. 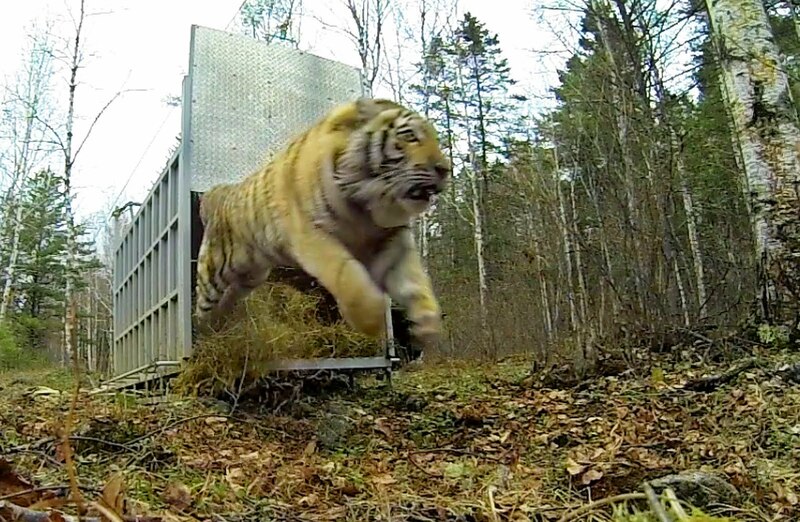 My soul moves forward hitting with its paws on the free lands. Whether it is the wild nature or the creative illuminative mind of a person. © Author – Arlen Shahverdyan, 12.05.2016. The image of the author’s book Spring Requiem. 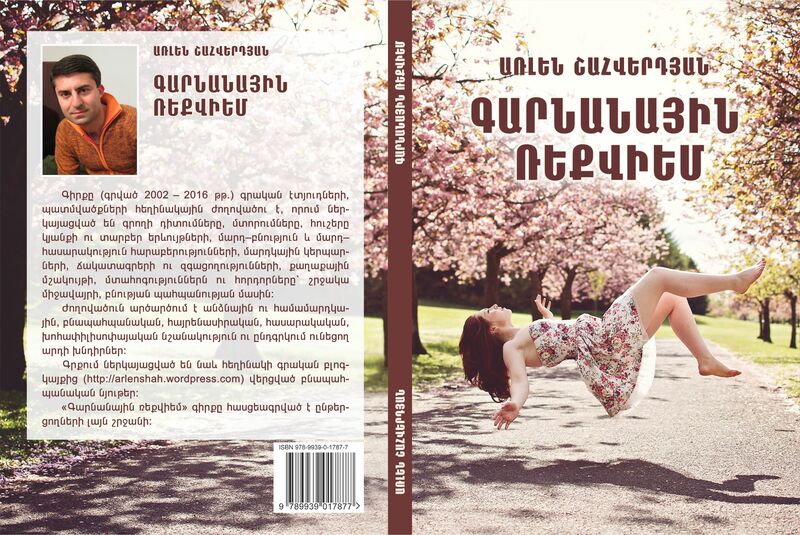 The cover of the book by Arlen Shahverdyan. The cover is Copyright protected. © All Rights Reserved, 2016. This clip is presenting the publishing process of the book Spring Requiem at the Limush Printing House. The clip is copyright protected and specially made for the publishing and presentation of the book Spring Requiem and is presented with the exclusive right to display it only on my Youtube channel. Dear readers, I my pleased to inform you that my new book entitled Spring Requiem has been published, which is a collection of stories and literary etudes about love, nature, life, world. I express my deep appreciation to Armine Movsisyan, the editor of the book, and Vahe Khalafyan, the technical editor for their top quality professional work as well as for friendship of many years. The book has been published at the Limush Printing House and the publication is of high quality. 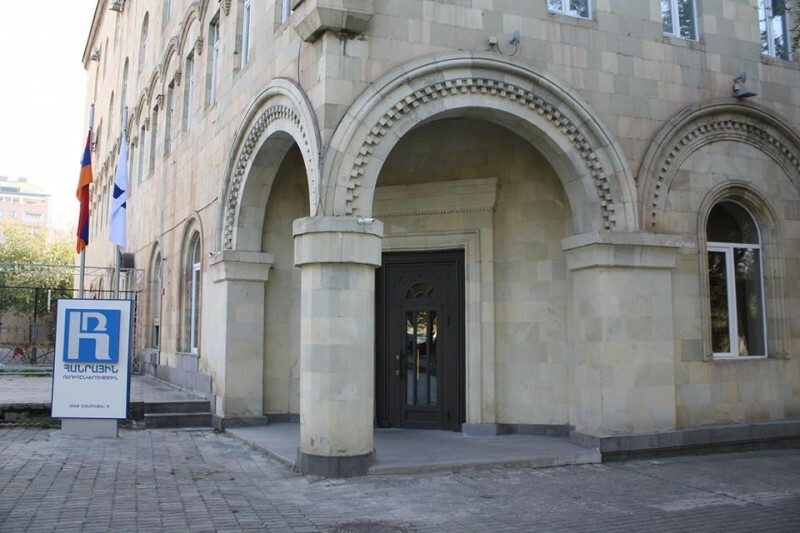 I cordially thank Yeghishe Darbinyan, Hasmik Piloyan and Nona Amirkhanyan, as well as the whole staff of the Limush for their professionalism, conscientiousness and concern. You can buy the book only at the popular book store Noyan Tapan. I want to thank Albert Yedigaryan and the whole staff of the book store for their careful attitude towards the book. This is a limited edition book, so hurry to get your own example of the Spring Requiem. I wish you pleasant reading. Youth program of the Public Radio of Armenia called “LyunSe” was first broadcast on 27th December, 2004. The program is on air (FM107.7) every day except Sundays. “LyunSe” is a program about youth, so its aimed at young people. It covers social, economical, environmental, cultural, educational and sport topics, as well as the most urgent issues concerning youth. “Find your light, not to become other’s shadow” is the motto of the program. 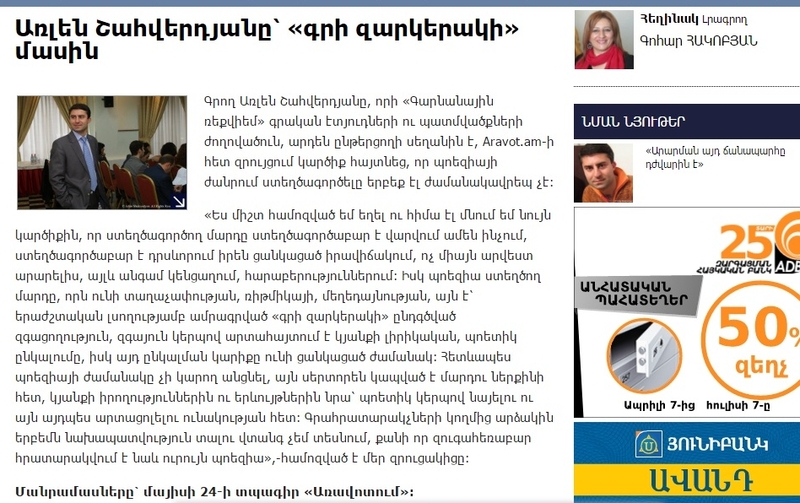 In 2009 “LyunSe” won “Azdarar” prize of the Journalists’ Union of Armenia.